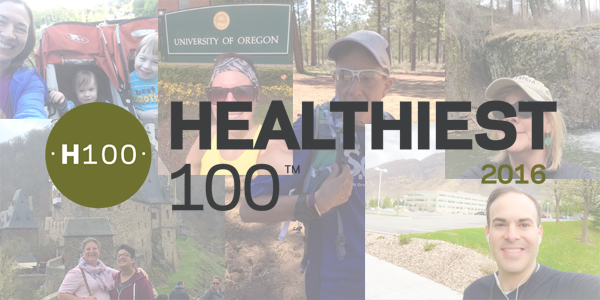 Cambia Health Solutions is proud to be recognized as one of the 100 Healthiest Employers in America. Out of over 1800 submissions, we came in at number 24. Winning this award for the third year in a row is a point of pride for us, as employee health has been a long-time focus for Cambia and its family of companies. Our holistic health initiative, the Wellpower program, integrates all areas that affect worker health and wellbeing. Culture and leadership commitment: Our executives are an integral part of our workplace wellness program, championing healthy lifestyle choices, developing health-focused company polices and participating in wellness activities. Employee participation and engagement: We invest in our employees, encouraging healthy choices, from low monthly fees for our onsite gym, to discounted prices for healthier meals at our café. Cambia employees also receive discounts on their health insurance premiums based on participation in wellness activities. Risk measurement: We hold free annual biometric screenings to help employees monitor health risk factors, including blood pressure, blood sugar, body mass and weight, as well as a baseline to measure improvement. Congratulations to all the companies who made the list of 100 Healthiest Employers in America. We know developing a wellness framework and healthy initiatives is a huge undertaking and we respect their accomplishments.